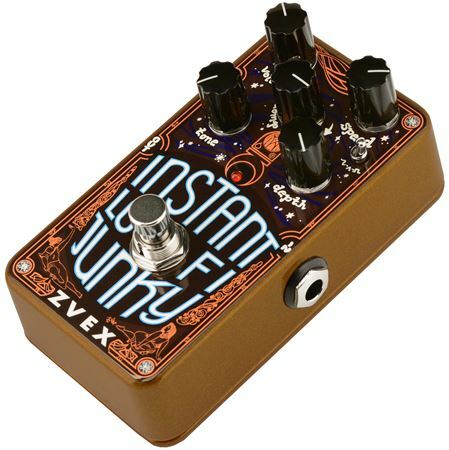 Order your ZVEX Vertical Instant Lo Fi Junky Chorus Vibrato Pedal from AMS and enjoy 0% Interest Payment Plans, Free Shipping, Free Extended Warranty & 45 Day Money Back Guarantee. 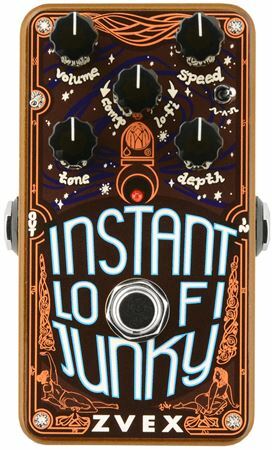 The Vertical Instant Lo-Fi Junky is a vertically oriented version of the ZVEX Vexter Instant Lo-fi Junky which is a composite pedal of sorts. Joel Korte, the extraordinary engineer behind this device, was able to create a combination of THAT chip com-pression, Belling bucket-brigades, and ultra-low-current National Semiconductor op-amp filters to exquisitely copy the texture and feel of the original Lo-Fi into this new and extraordinary box, adding some new sounds that have never been heard before. Power Supply: 2.1mm barrel 9-volt negative tip, like Boss TM PSA adapter. Power supply not included. Warranty: 2 Year nontransferable Warranty against manufacture defect.